Everybody has autumn on the brain, which was clear by the number of fantastic fall activities linked up to last week's party. 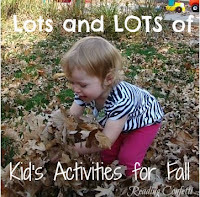 I've rounded them up (yes, even the round ups have been rounded up) to bring you 67 bajillion* fall activities for kids aka Enough Ideas to Keep Your Kids Busy with Fall Activities Until NEXT Fall. Nothing says autumn like Leaves, and these activities are way more fun than raking them up. Unless you're a kid. Then they're equally as fun as raking. And for those of you who like to get the most bang for your click, check out these Fall Round Ups. Hilarious post. My kids are so eager to rake that they keep running outside and moving around the same 15 leaves that have fallen already. They also attempt to jump in said leaves. It's not easy to attack a 15 leaf pile. Thanks for hosting and thanks for featuring my handprint apple trees and fun with fruit! We are in full Fall mode here! I just love this time of year :) Thanks for featuring our Apple Math games. What a great list. Thanks for the feature. LOL! Sounds like an accurate number to represent the number of posts. If we add those to last years ideas... Ok, that's too much math for this reading teacher! Lots of great ideas, though, I'm going to start picking a few to start. I'm so happy that it's finally FALL!